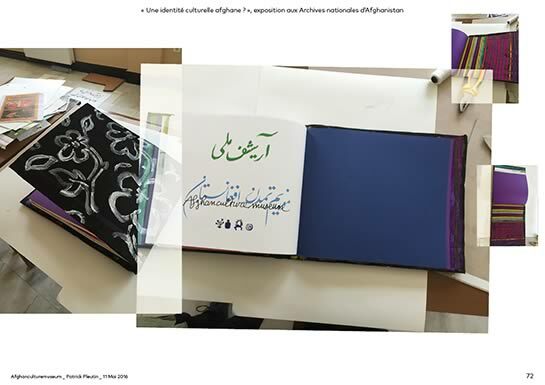 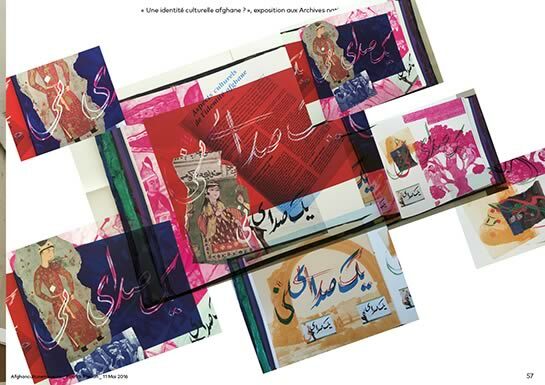 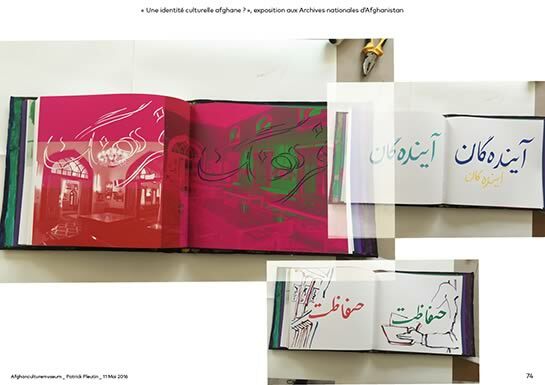 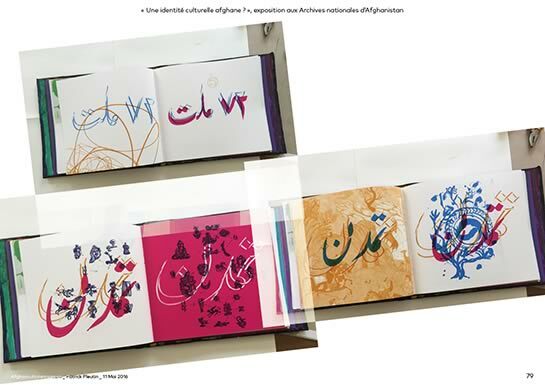 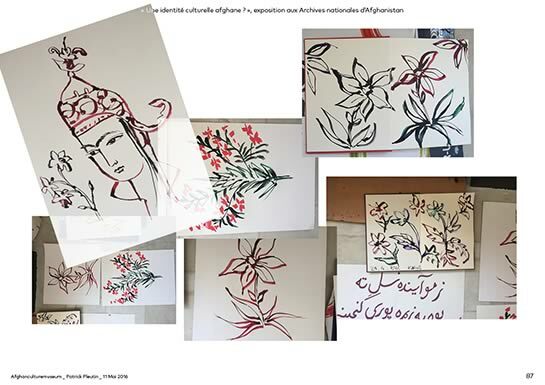 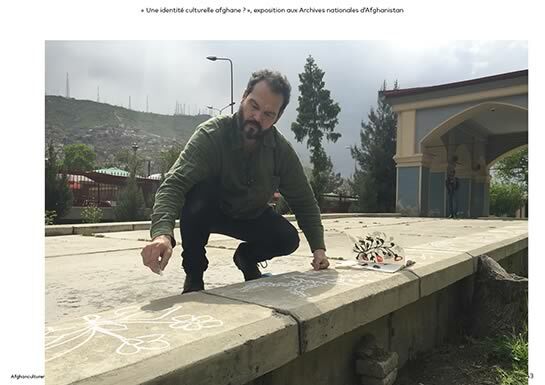 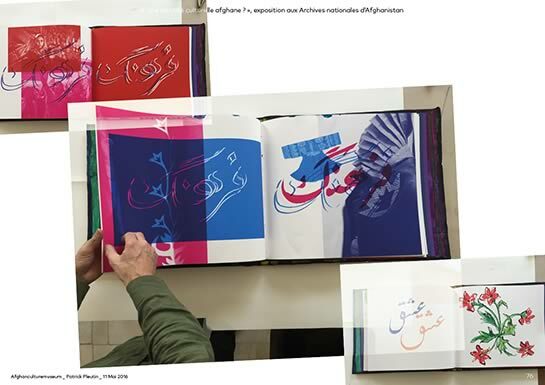 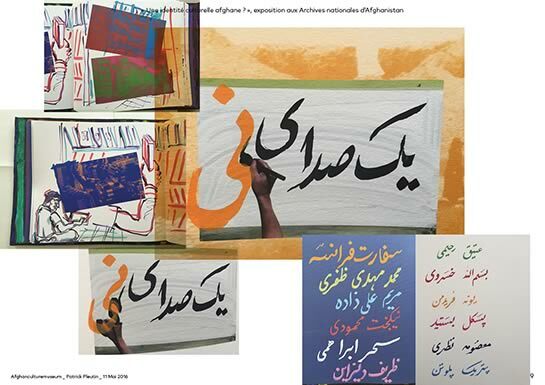 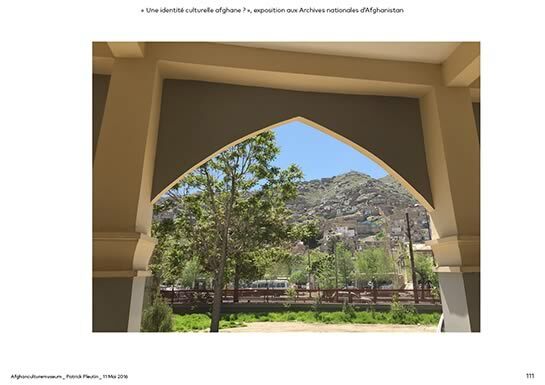 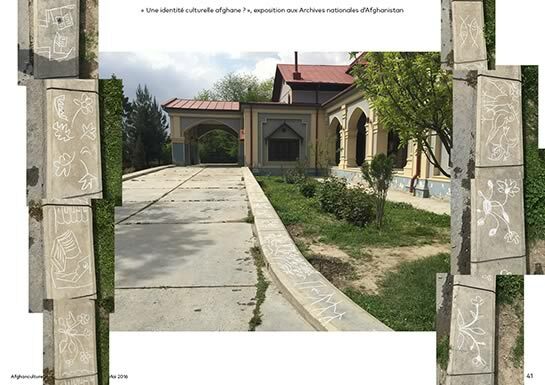 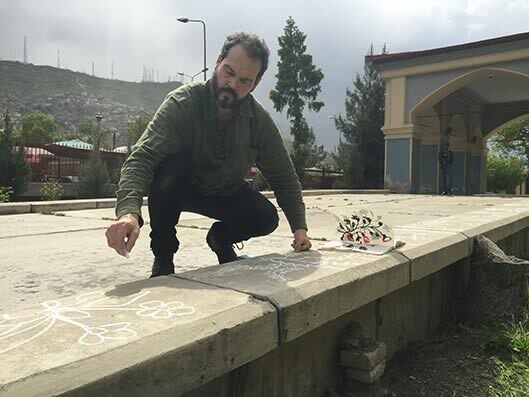 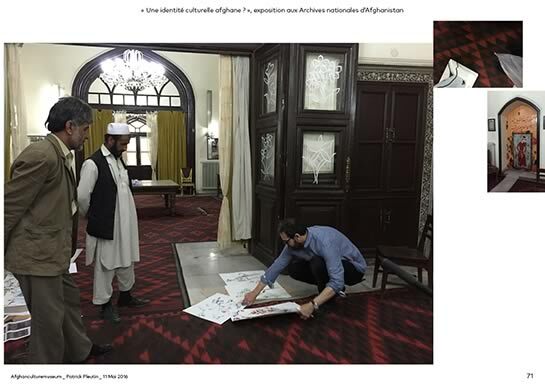 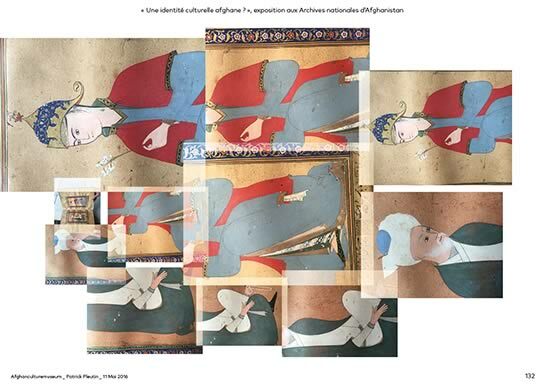 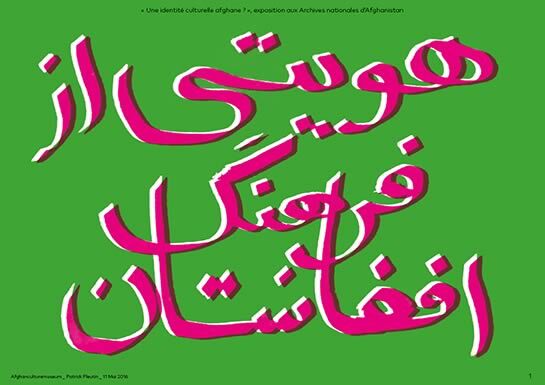 Patrick Pleutin texte An Afghan cultural Identity ? 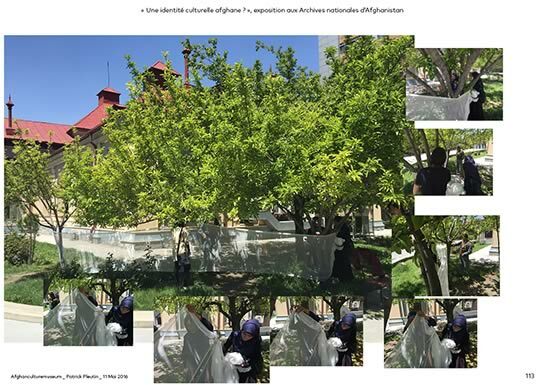 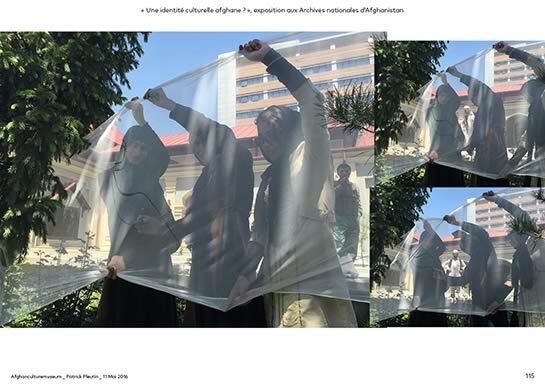 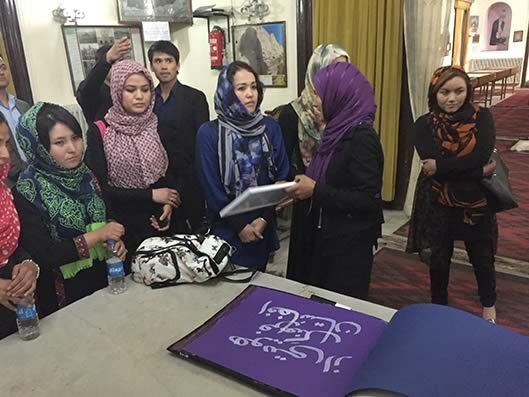 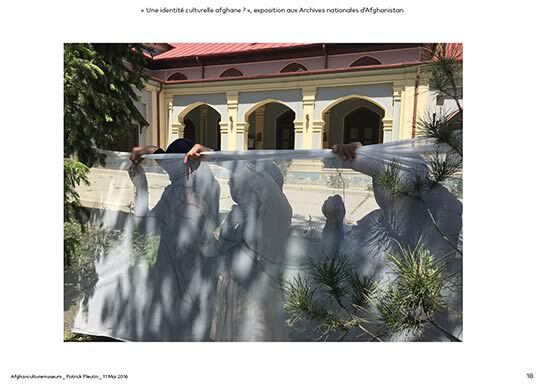 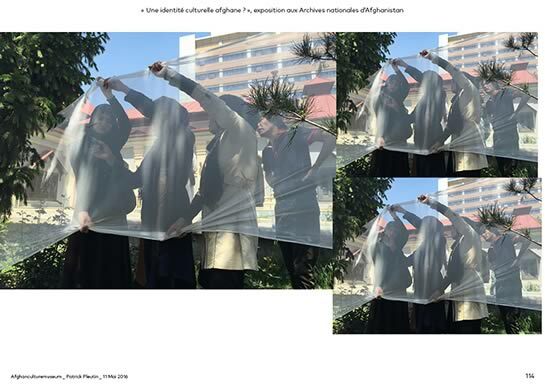 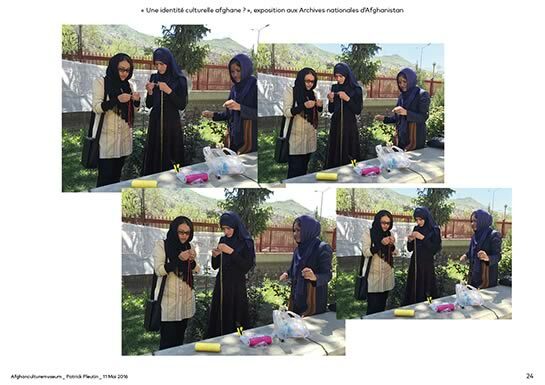 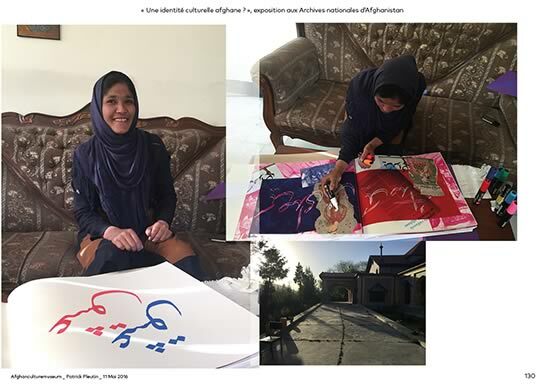 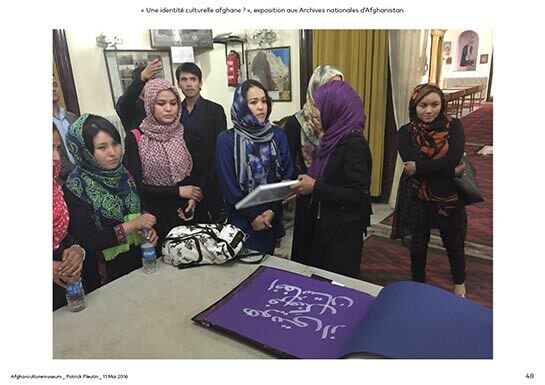 "An Afghan cultural Identity ?" 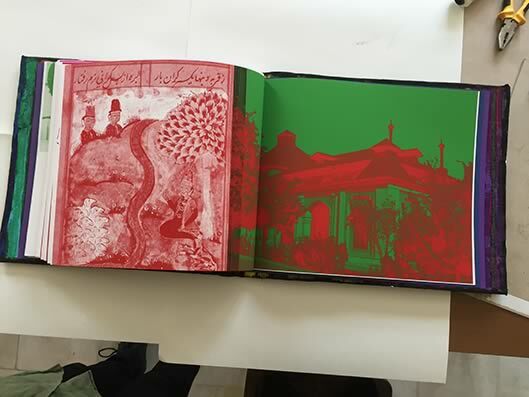 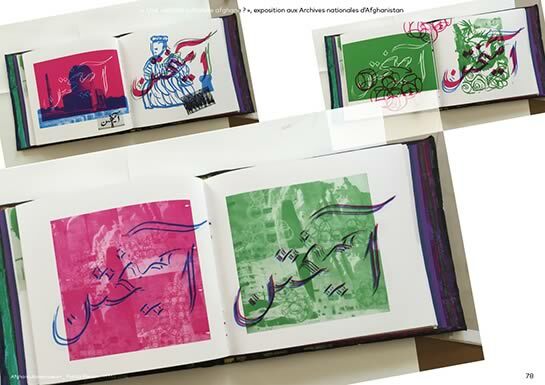 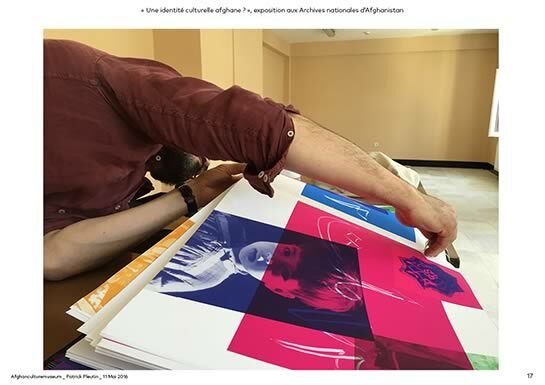 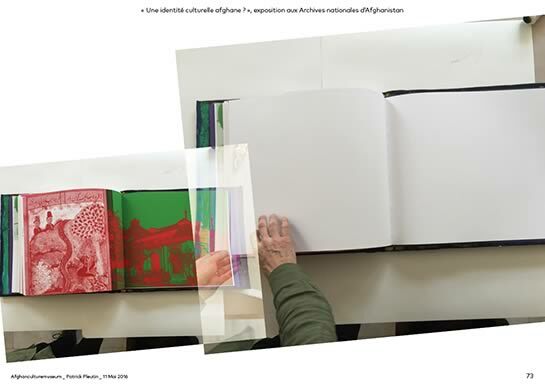 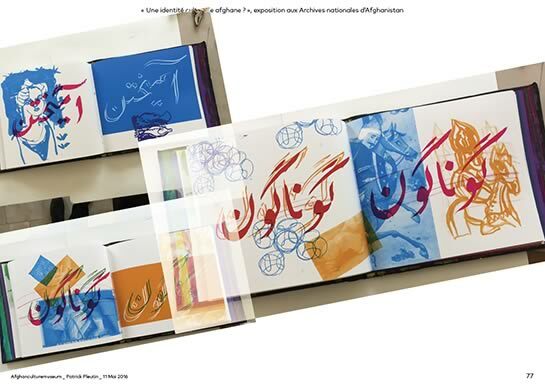 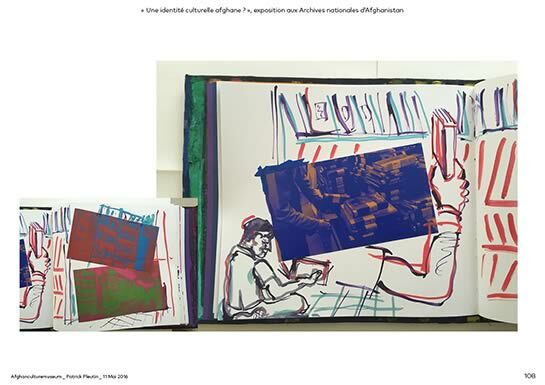 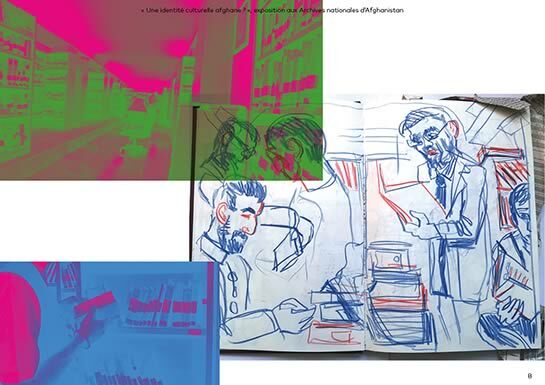 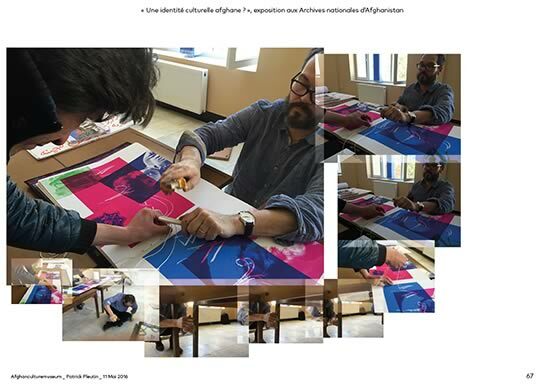 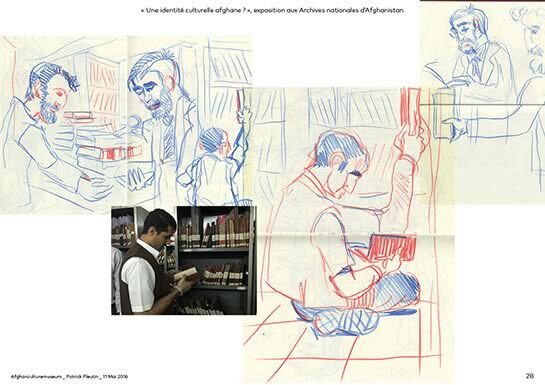 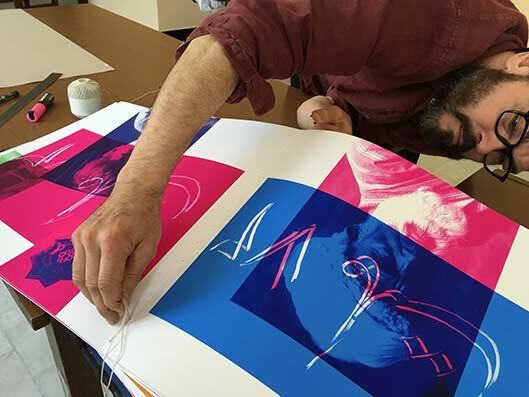 les œuvres : 2 films, 1 grand livre, 3 affiches intégrées dans l'architecture du musée, 30 tables vitrines calligraphiées, deux broderies sur du tulle installées dans le jardin et toutes les portes vitrées du musée peintes d'un herbier spatialisé inspiré des miniatures persanes. 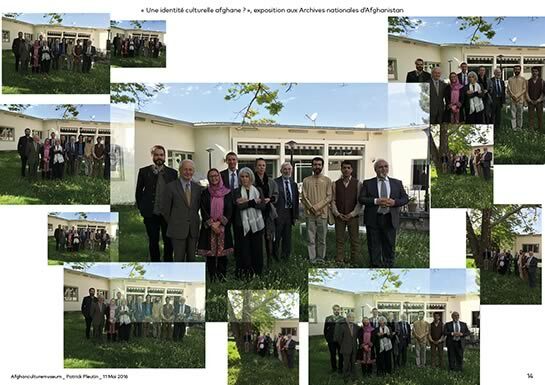 "An Afghan cultural Identity ?" 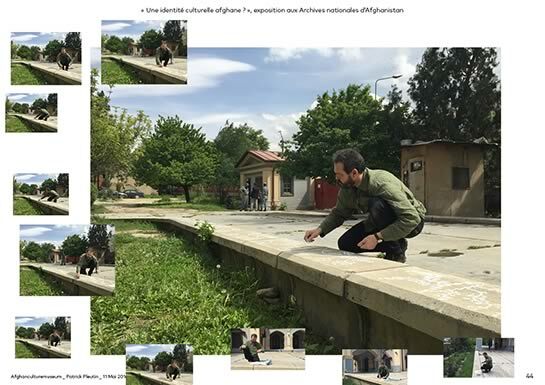 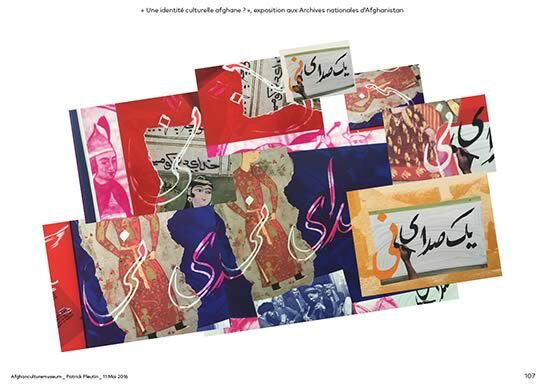 This exhibition intends to guide the visitor through different media to a possible answer to that question, which could only be resolved by linking the past and the present. 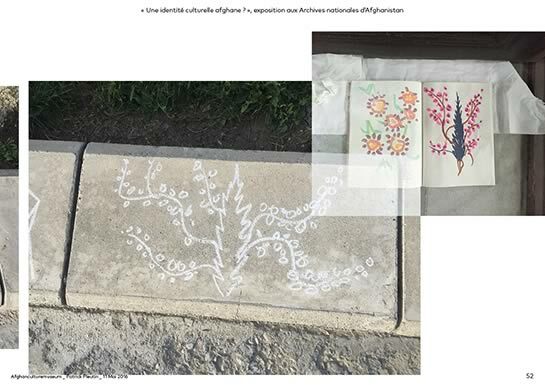 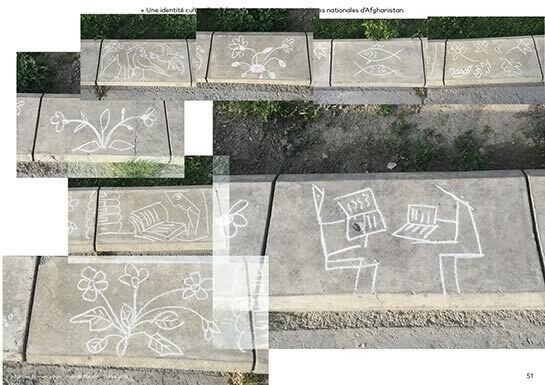 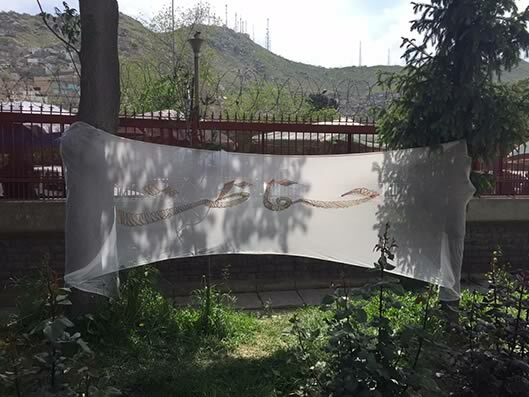 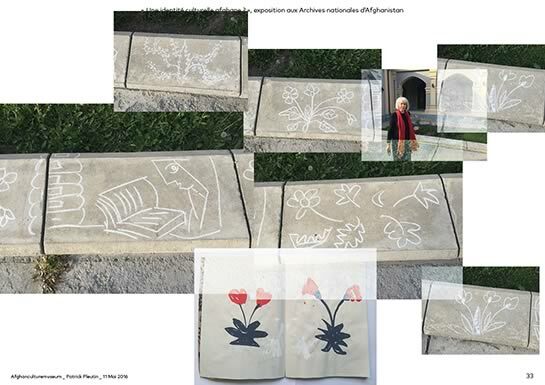 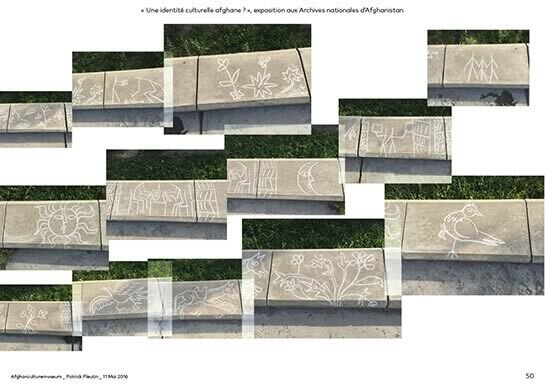 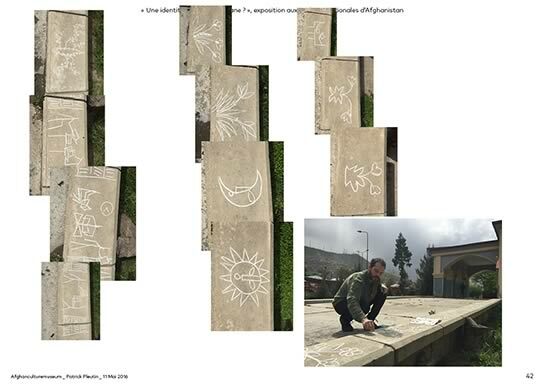 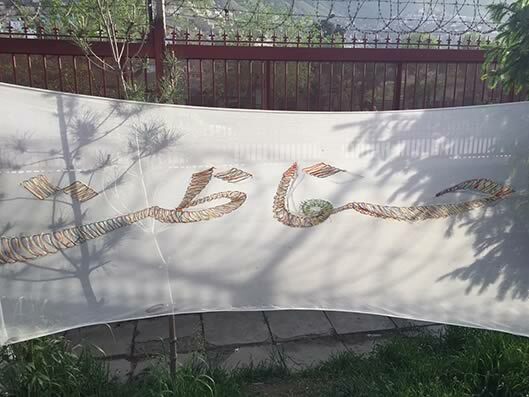 From the entrance two embroidered textiles with the words "conservation" and "future" great the visitor, a path bordered by chalk works representing ideograms meant to whet the curiosity, leads him or her to the entrance of the museum. 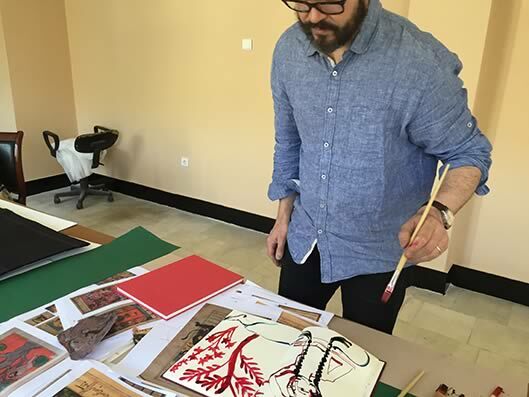 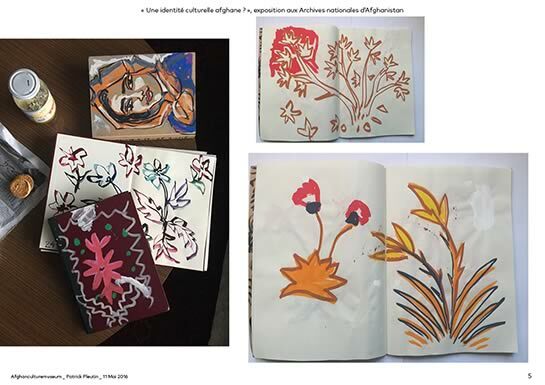 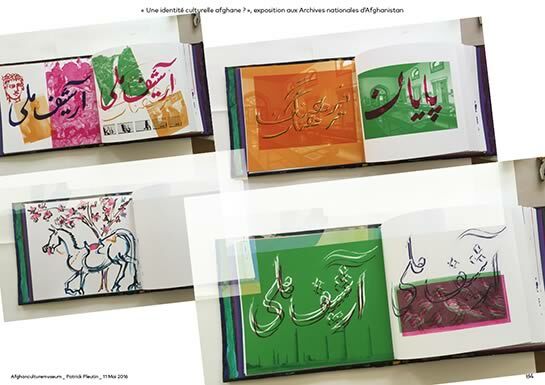 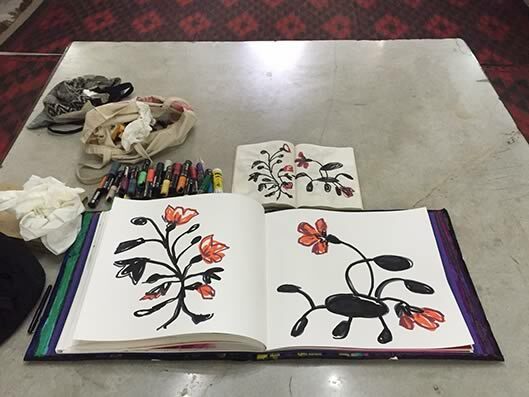 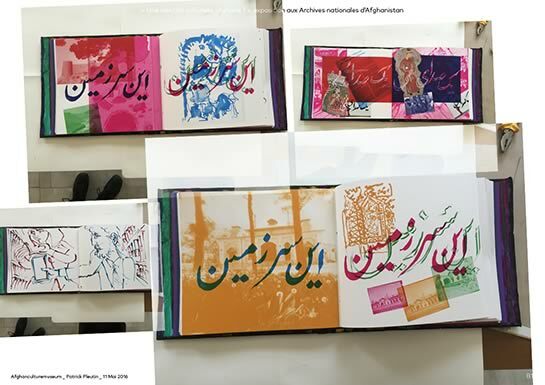 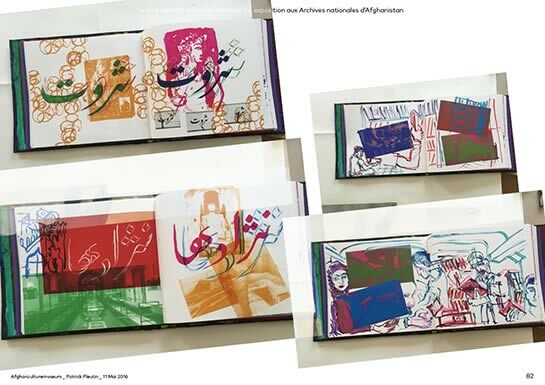 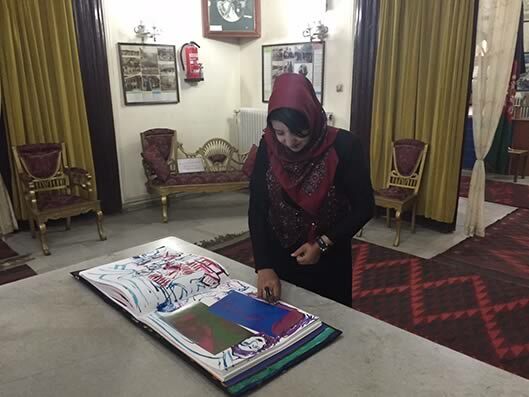 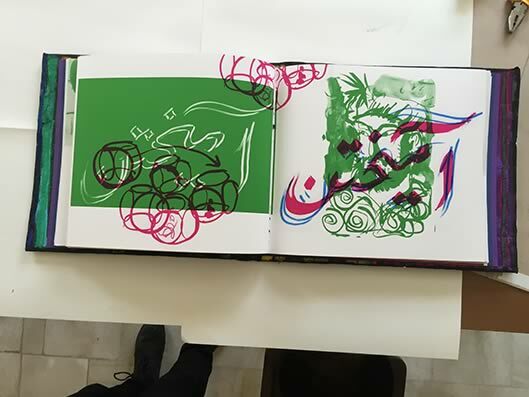 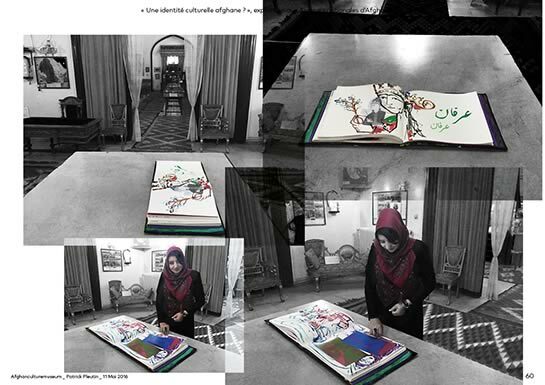 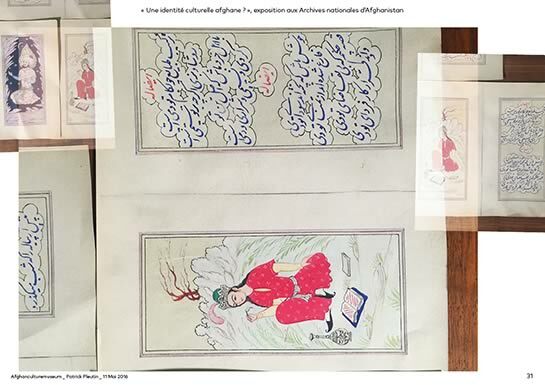 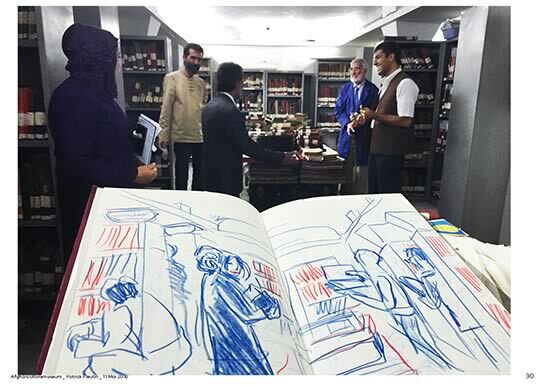 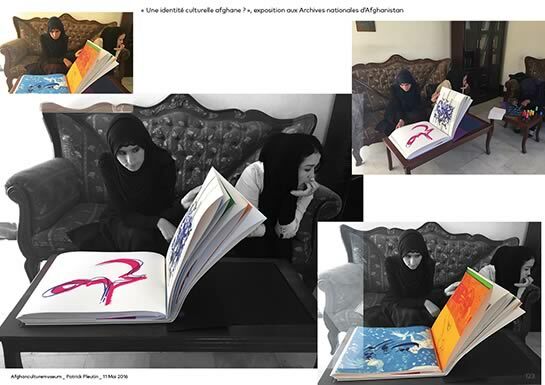 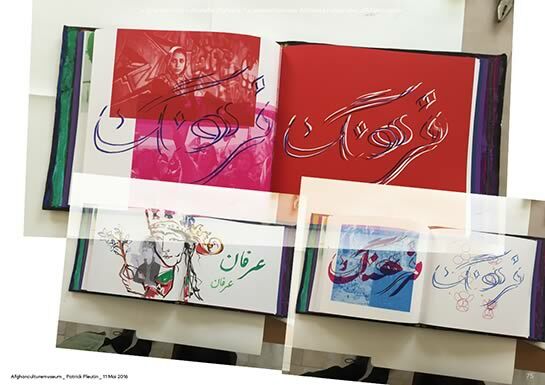 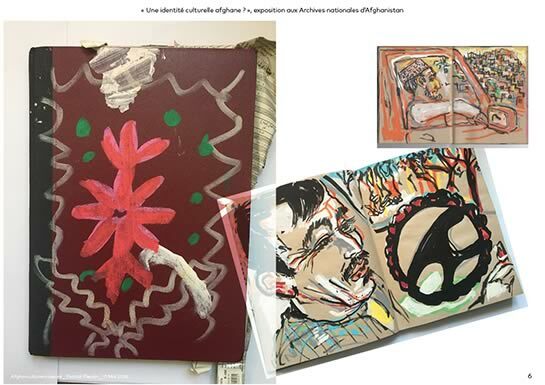 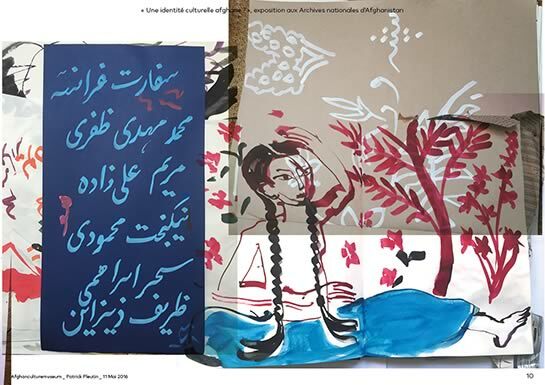 In the first room put on large table, an hand made painted book , an original piece of art, shows how documents of the past can seem as contemporary and seduce a young audience. 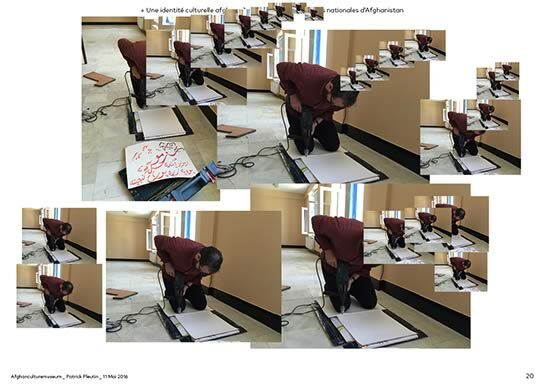 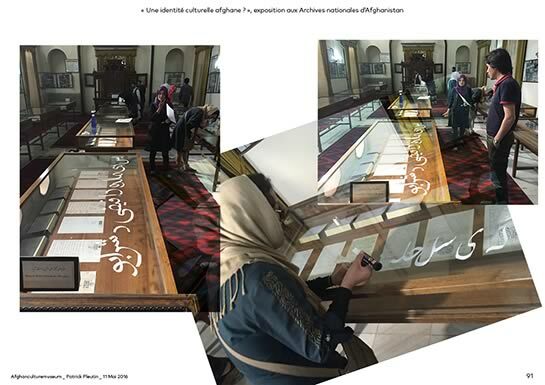 To invite the visitor to troll through all the galleries, poems are written with a flourish calligraphy on the 30 window desks presenting documents, miniatures and photographies. 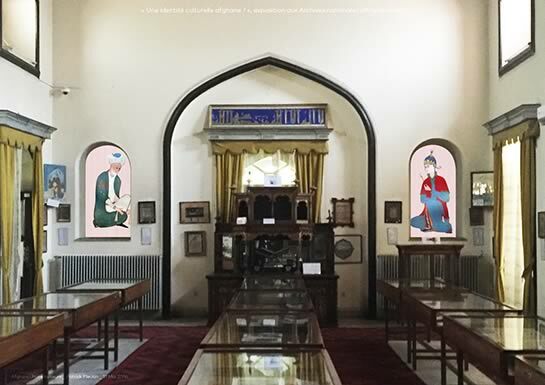 In the first gallery, on the right hand side, two niches have been filled up with enlarged miniatures, representing a woman and a man to emphazise the delicacy of the drawing and the colour, moreover the scale of the personages creates an immediate feeling of otherness . 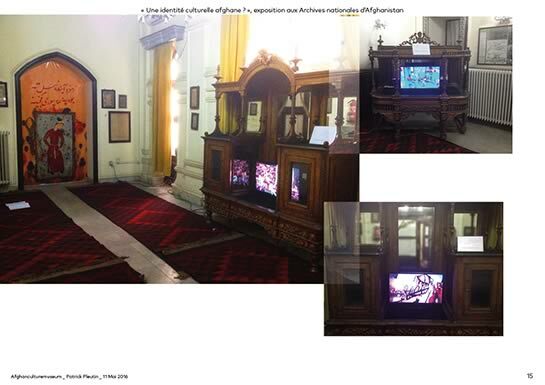 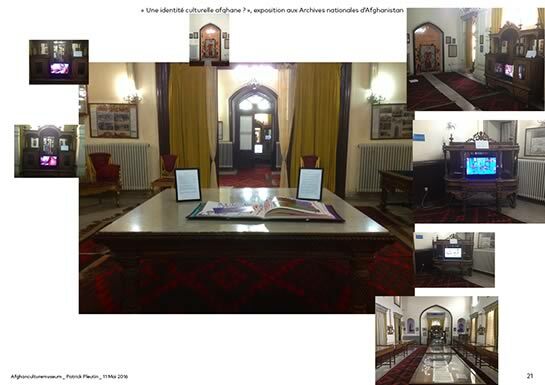 The third room welcomes a flat screen tv monitor, harmoniously integrated in the antique furniture of the National Archives. 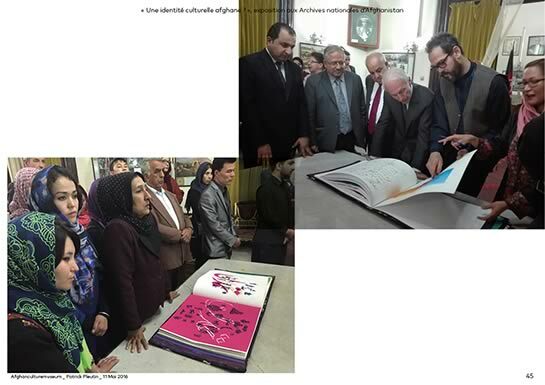 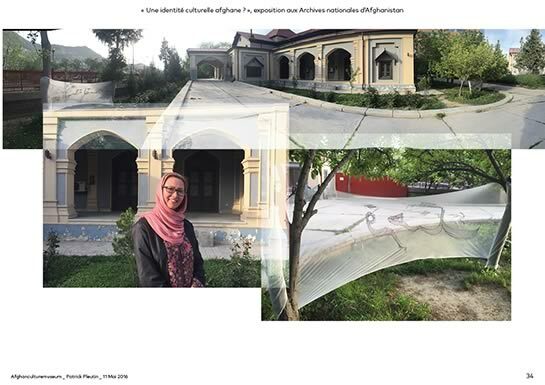 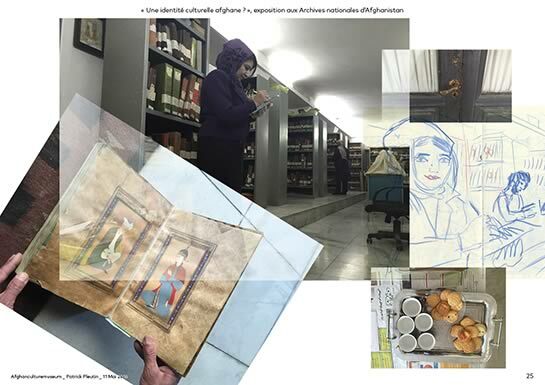 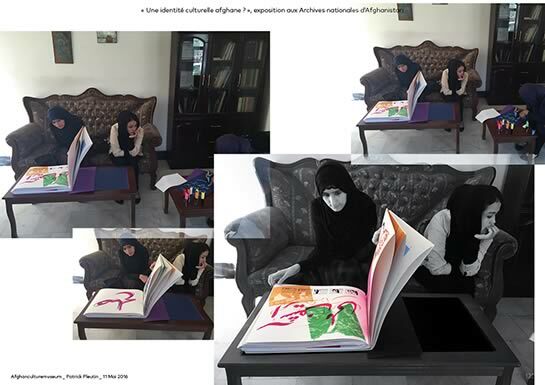 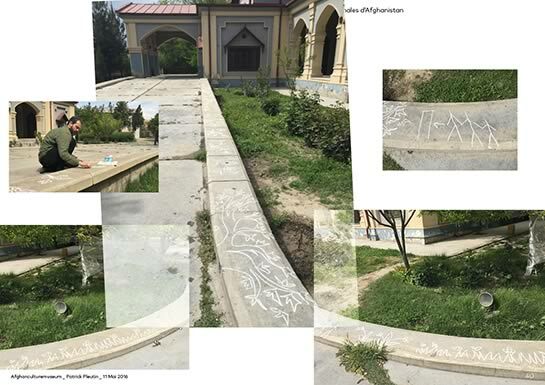 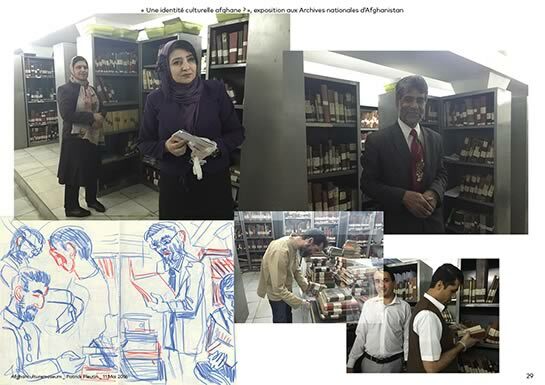 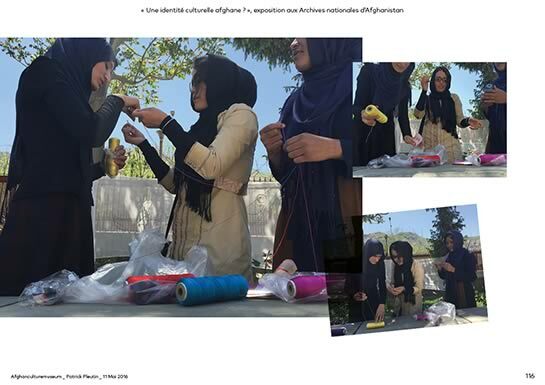 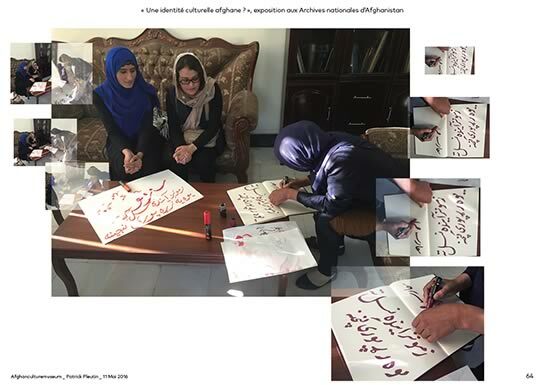 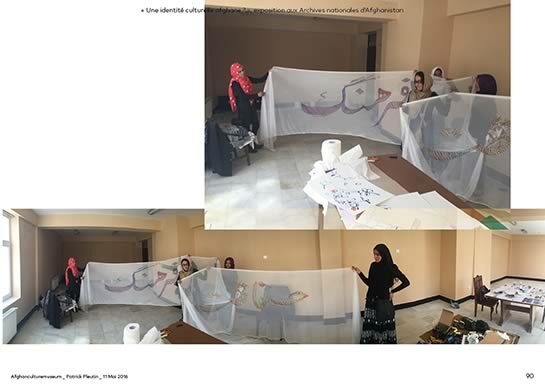 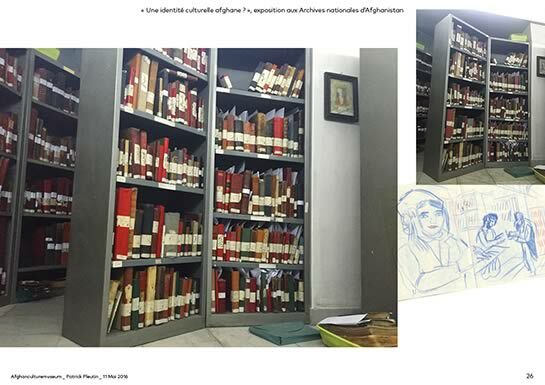 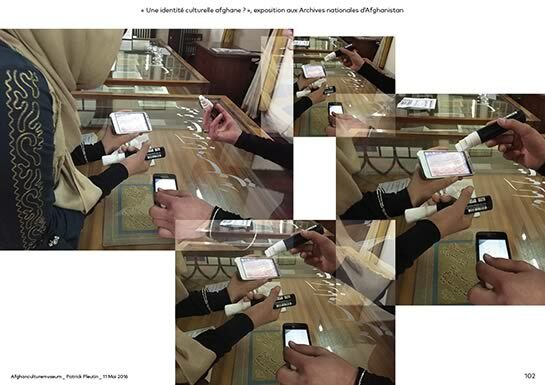 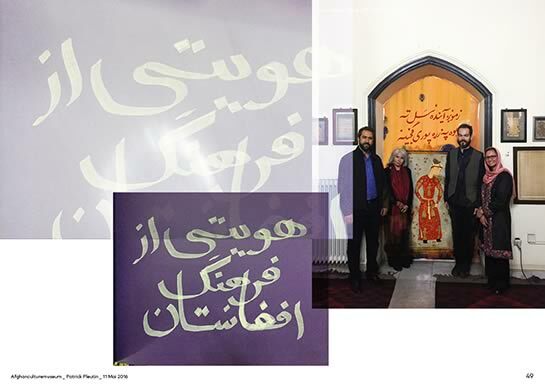 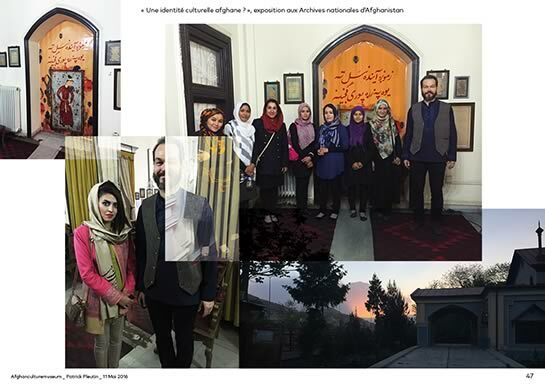 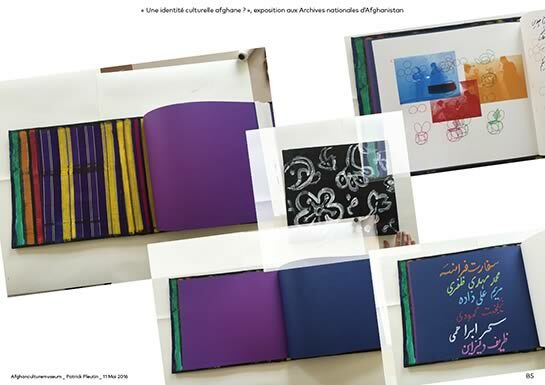 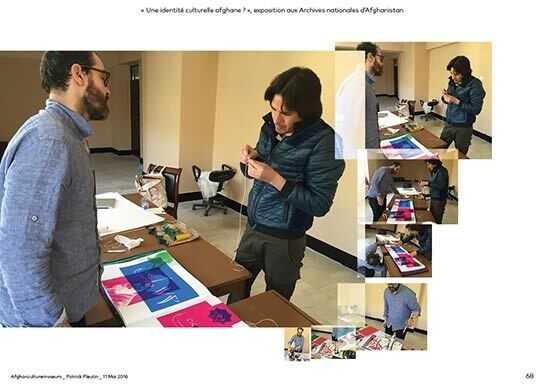 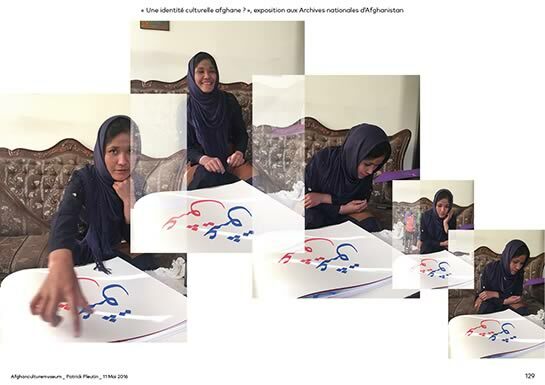 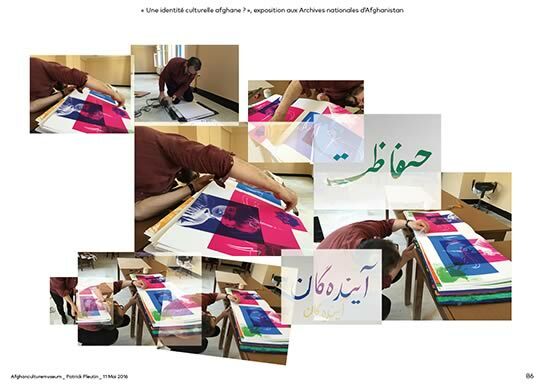 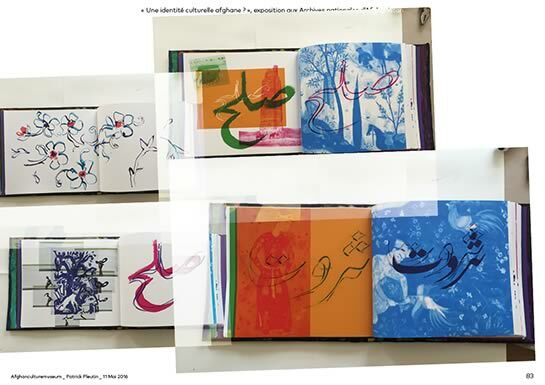 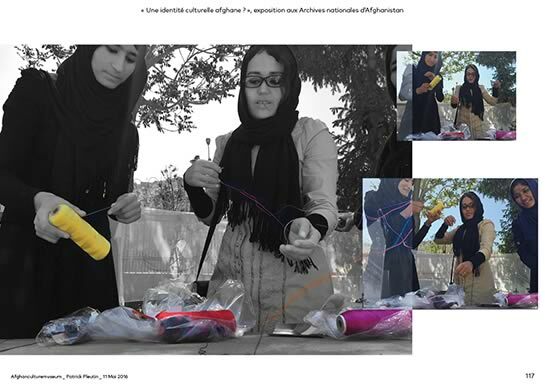 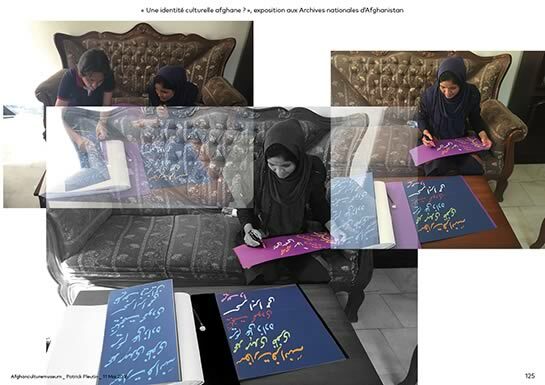 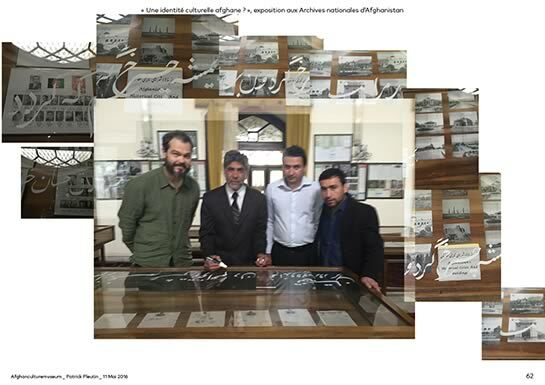 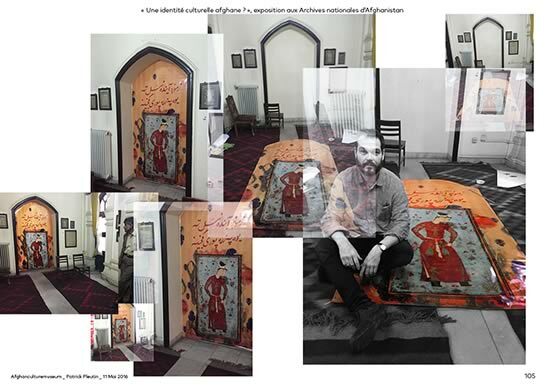 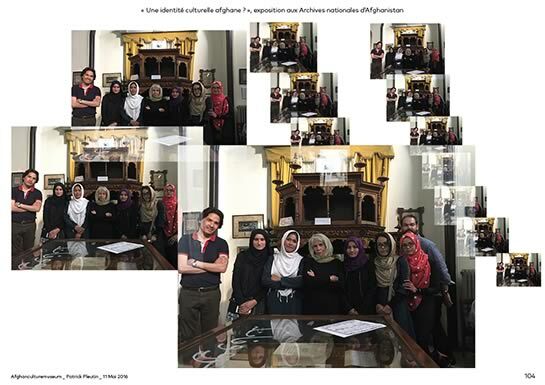 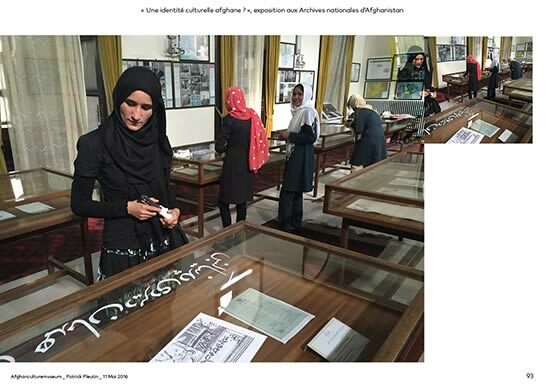 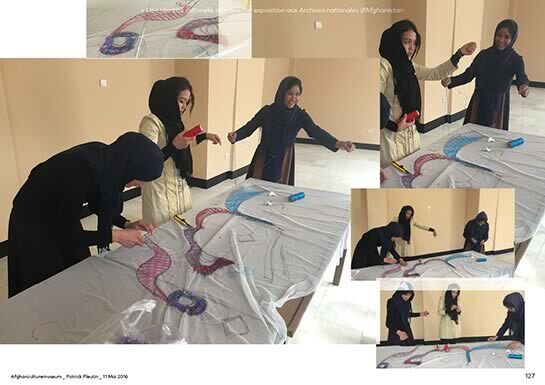 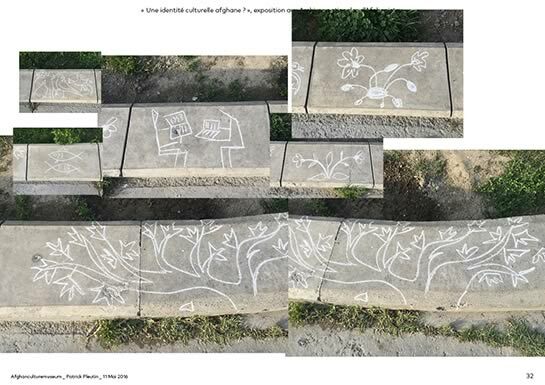 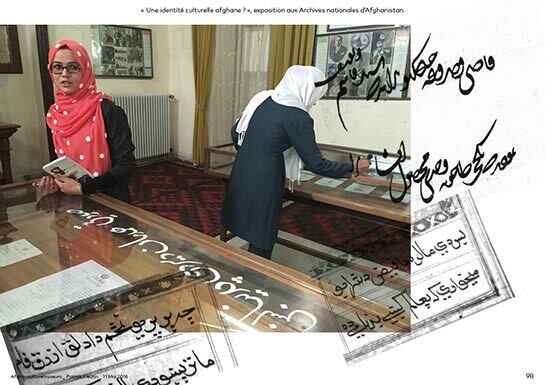 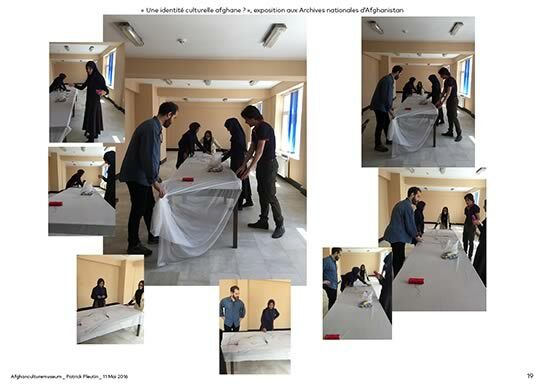 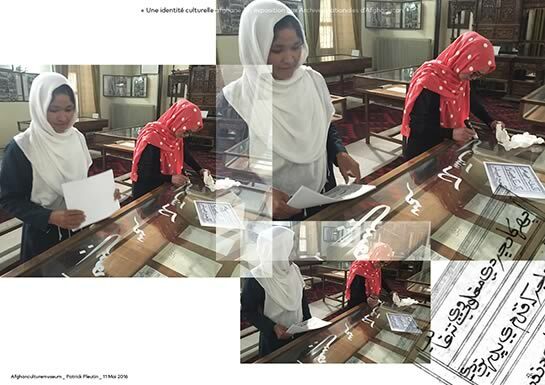 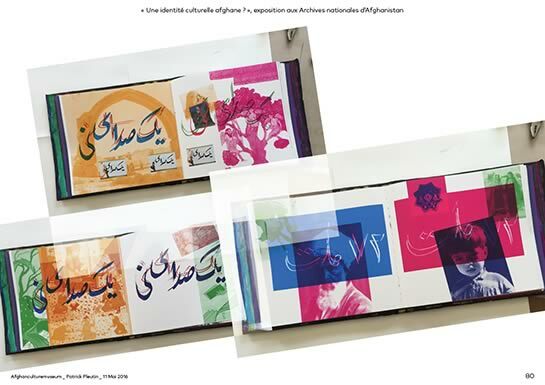 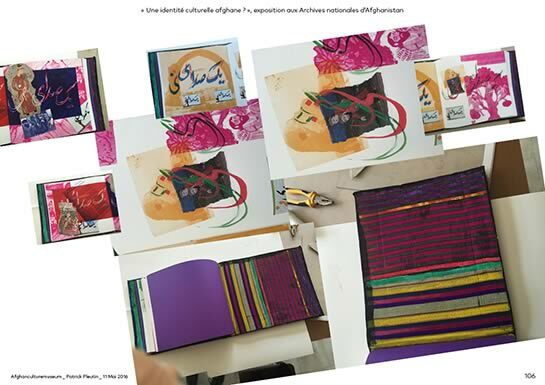 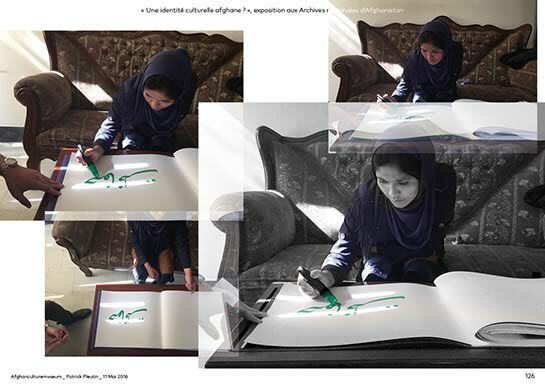 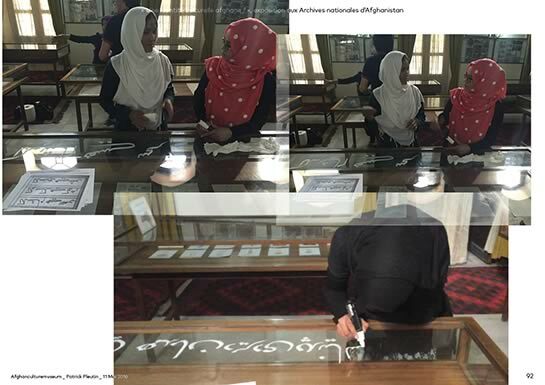 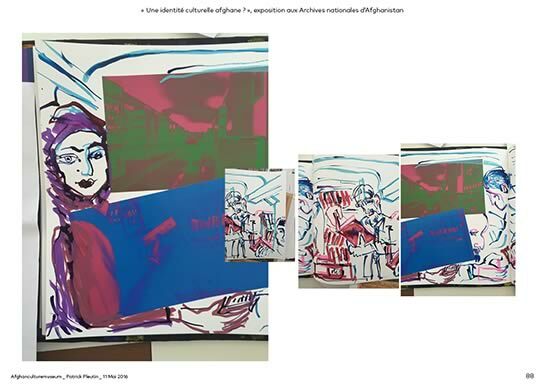 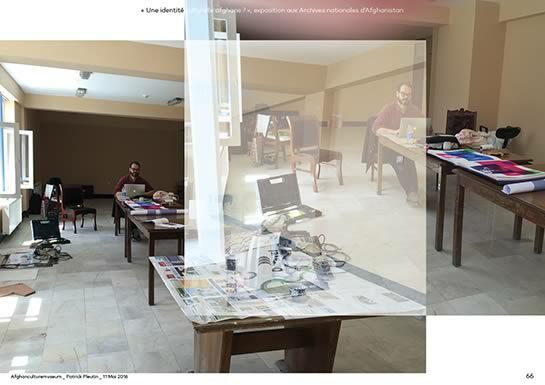 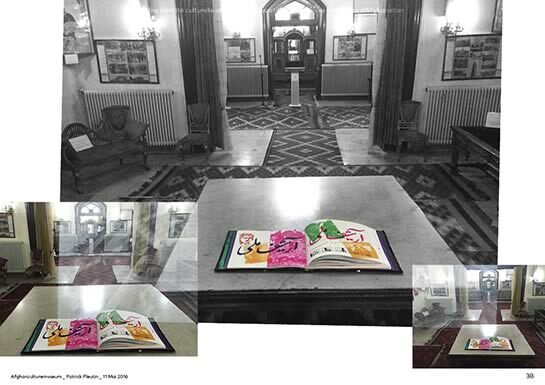 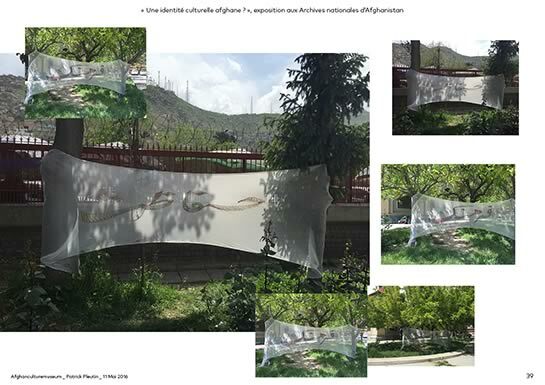 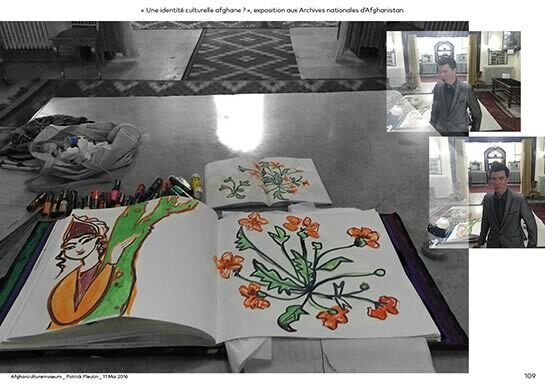 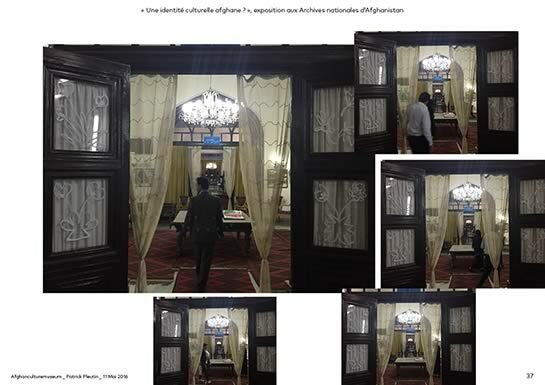 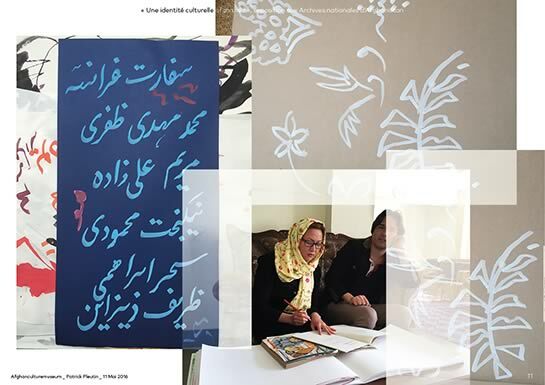 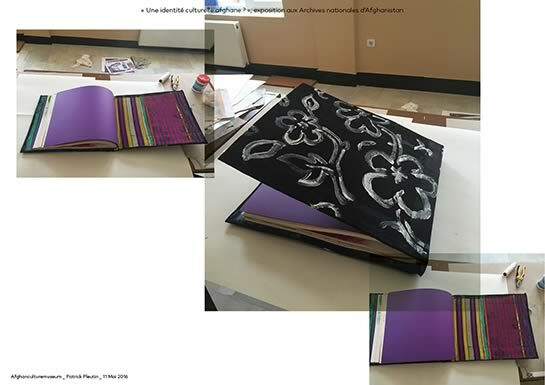 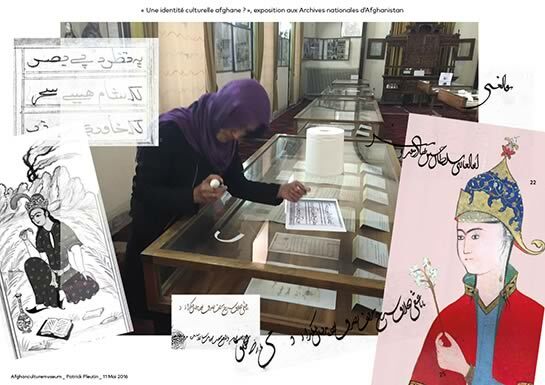 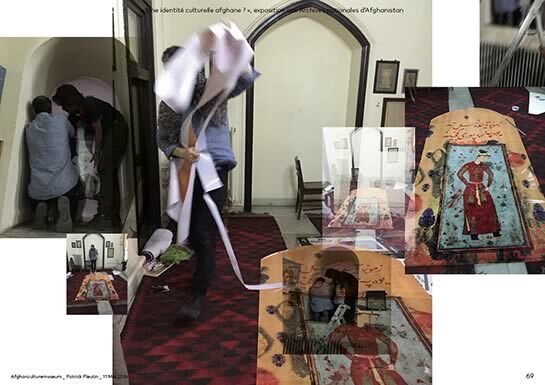 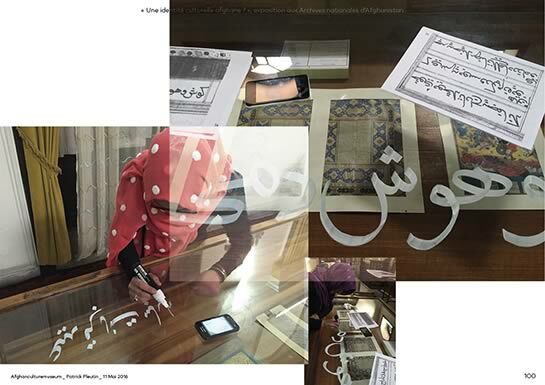 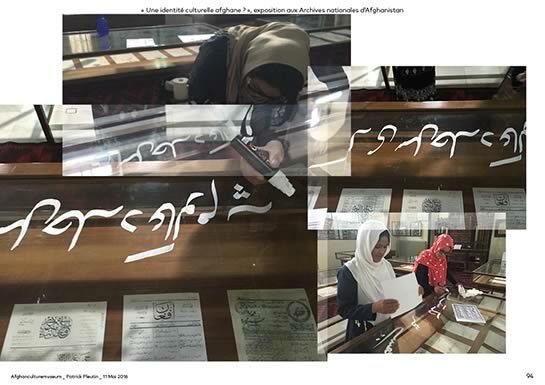 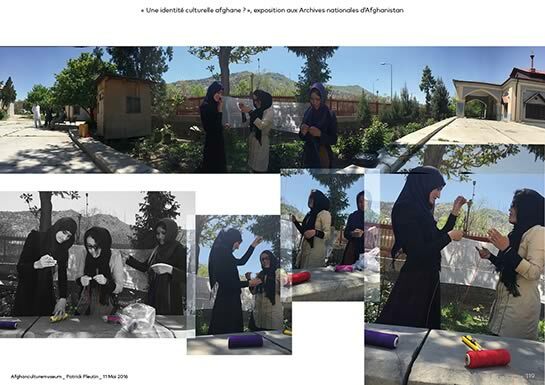 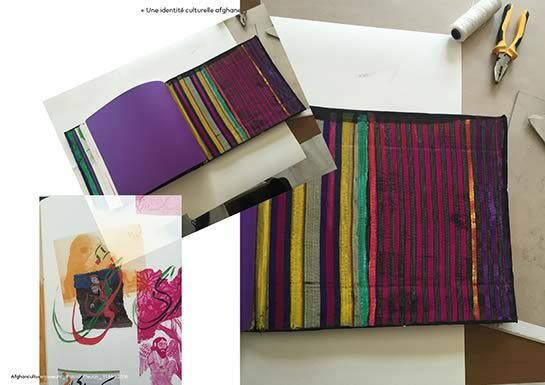 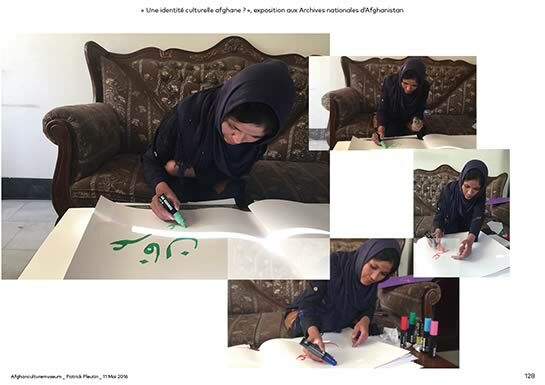 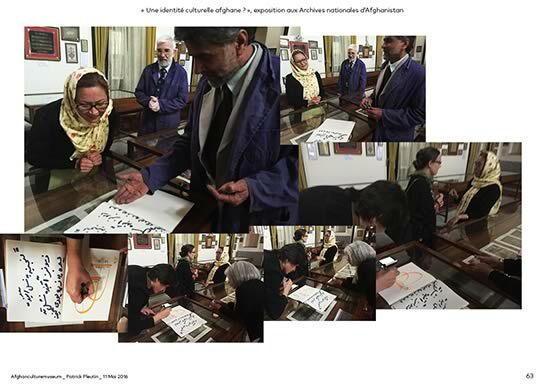 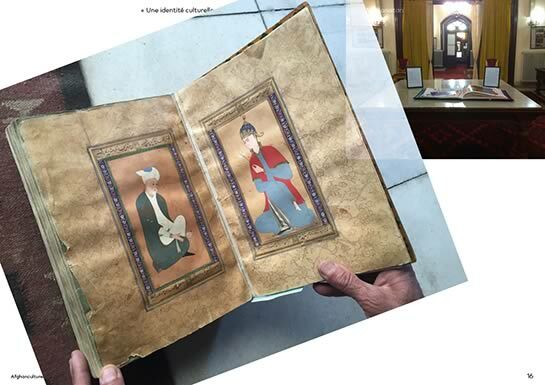 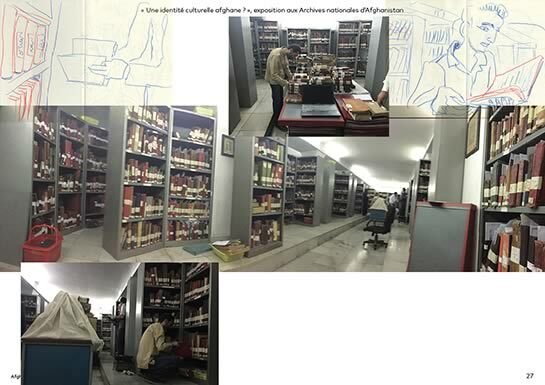 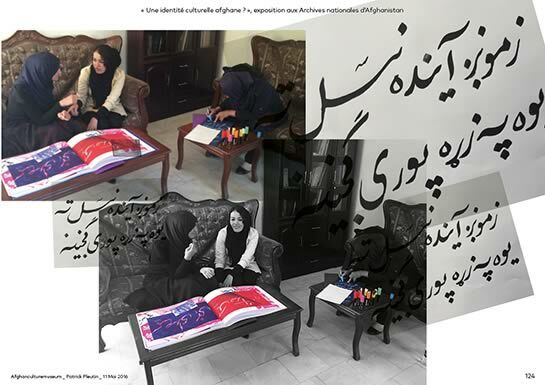 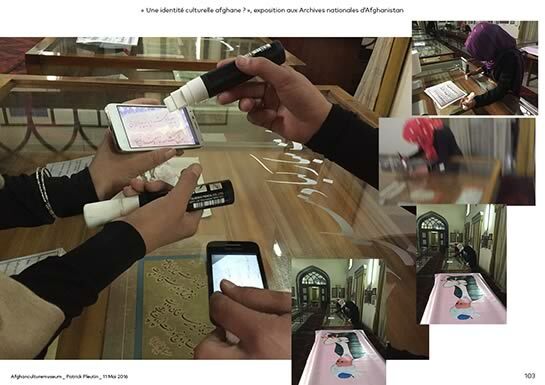 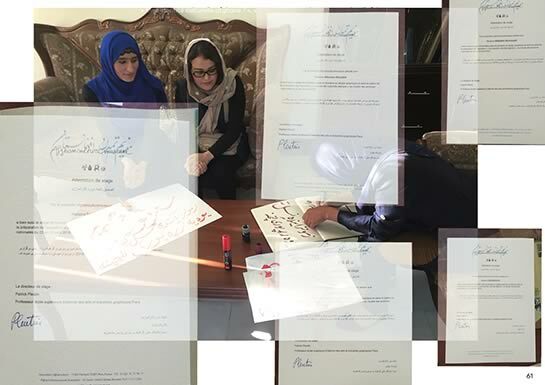 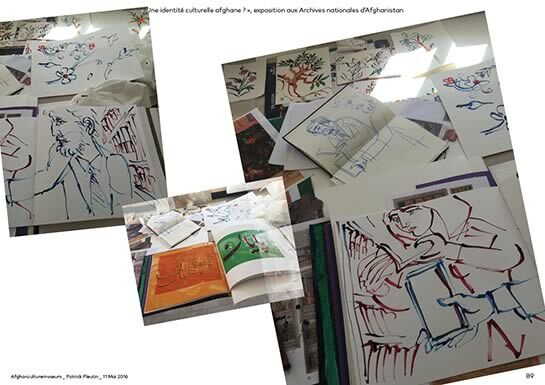 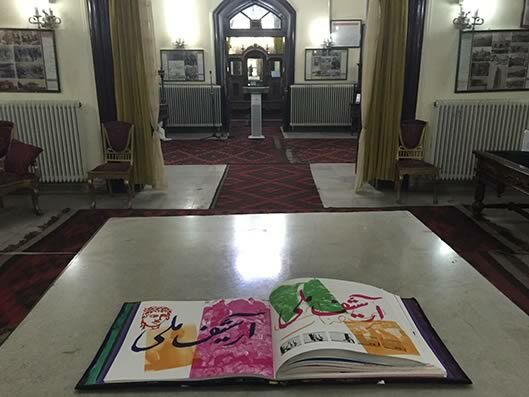 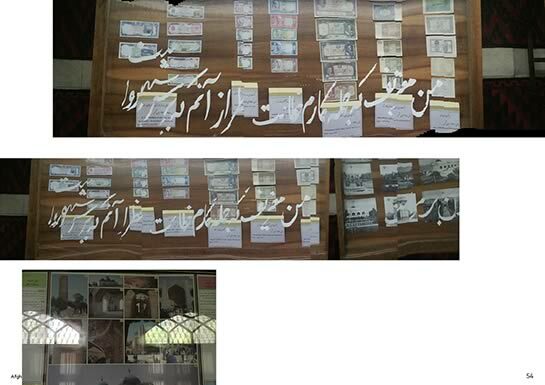 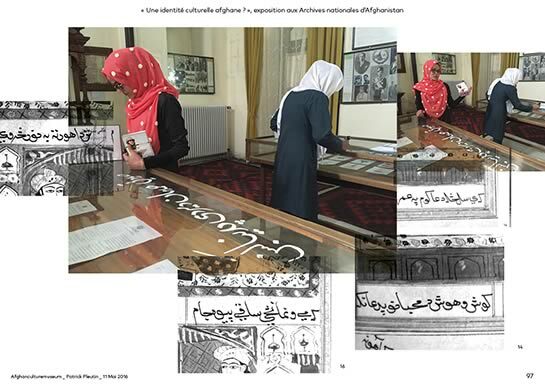 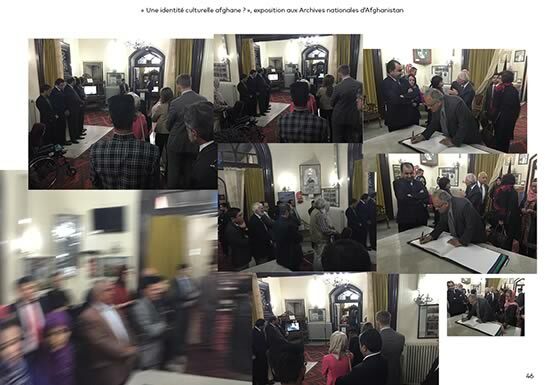 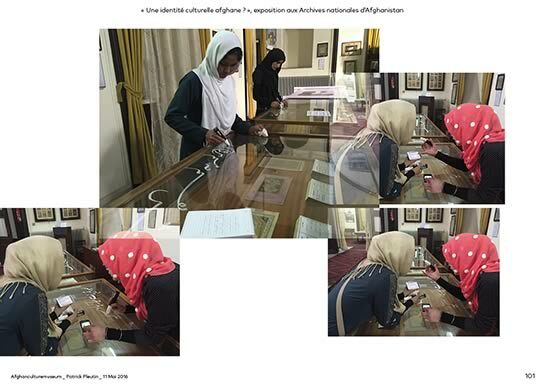 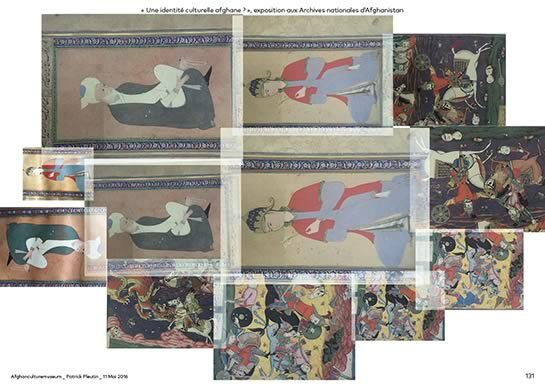 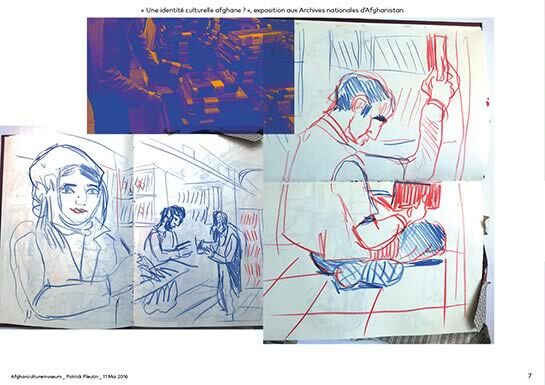 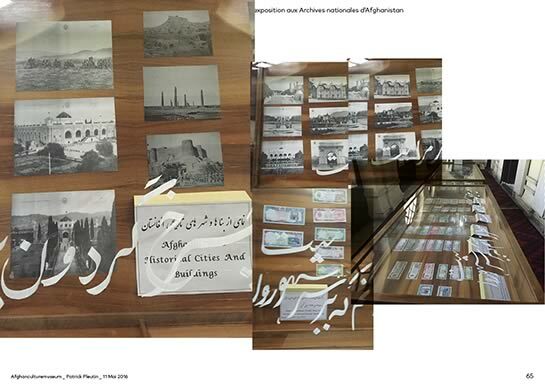 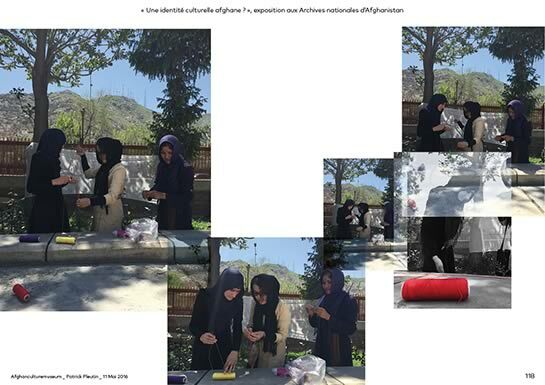 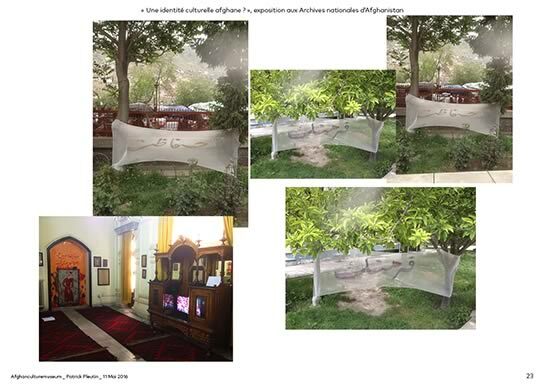 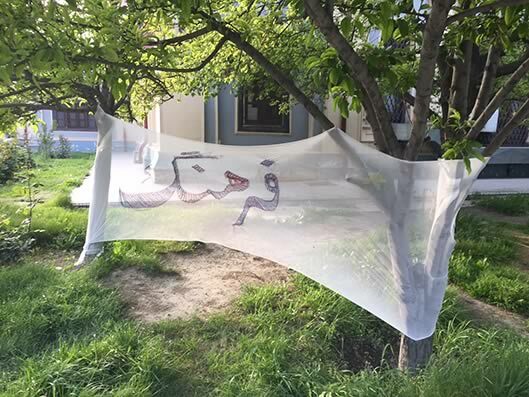 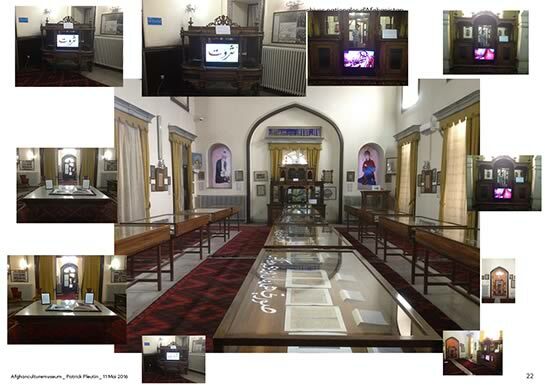 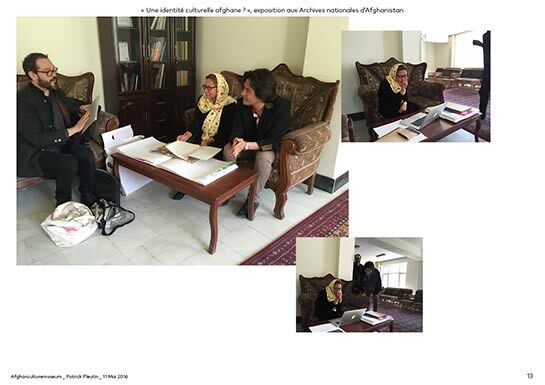 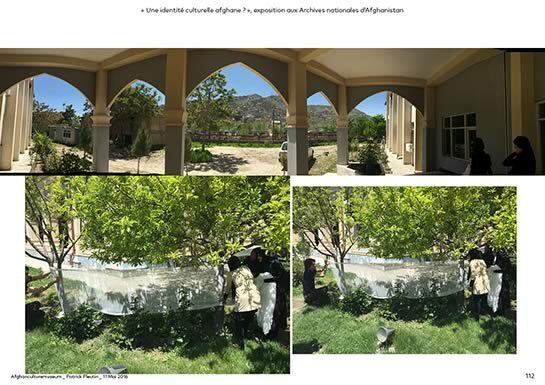 It presents the concept of the virtual Afghanculturemuseum whom the digital expression enables to mix 4.000 B.C. 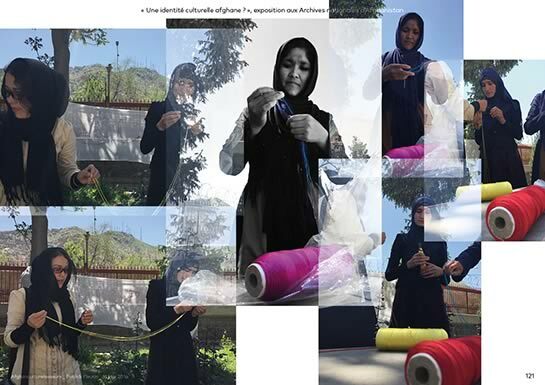 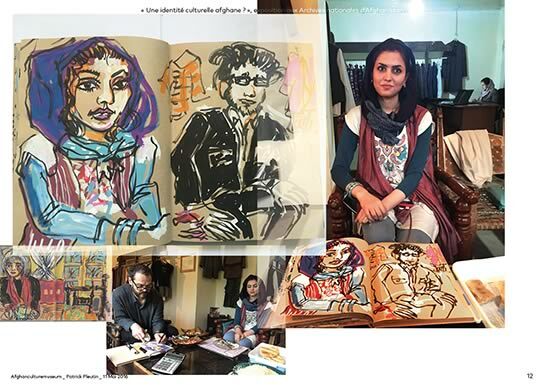 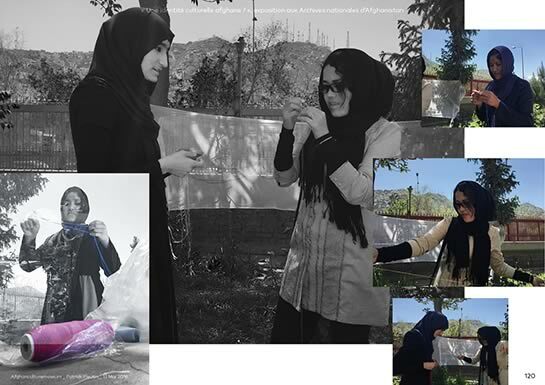 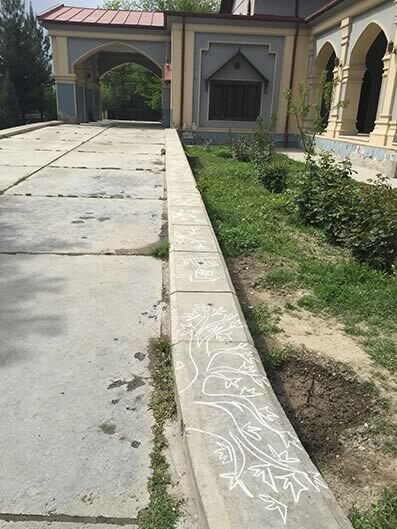 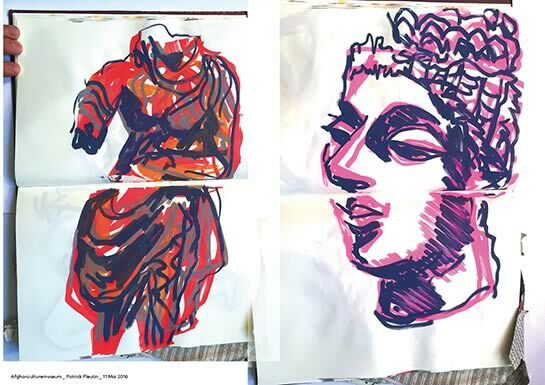 works of art with the contemporary daily life of the Afghan people. 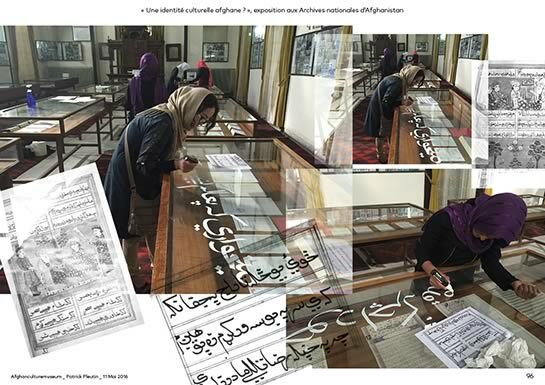 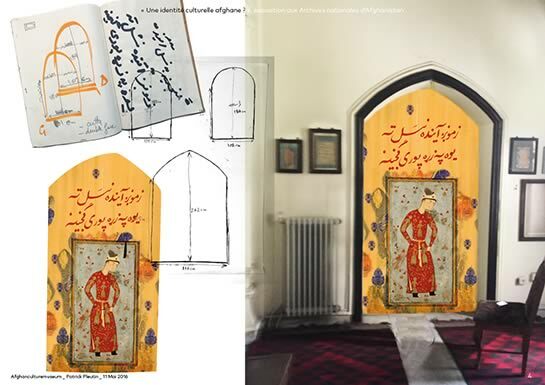 In the last room, under the watchful eyes of a young man of the 15th Century, another enlarged miniature entitled "Timeless treasure, a short film, after a text of Atiq Rahimi , composed of different types of images from The National Archives and enriched by live calligraphies, praise the different ethnic groups of Afghanistan , a delicate richness to be cherished. 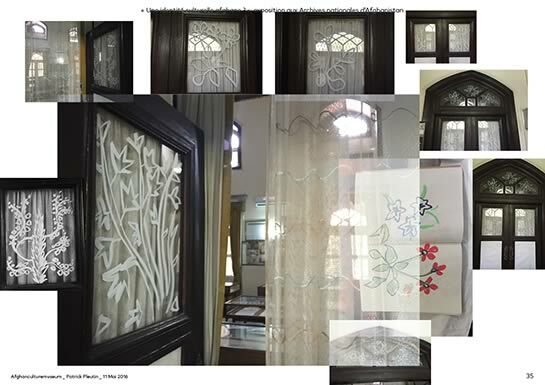 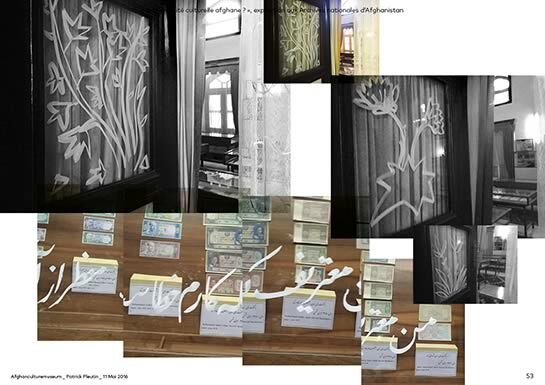 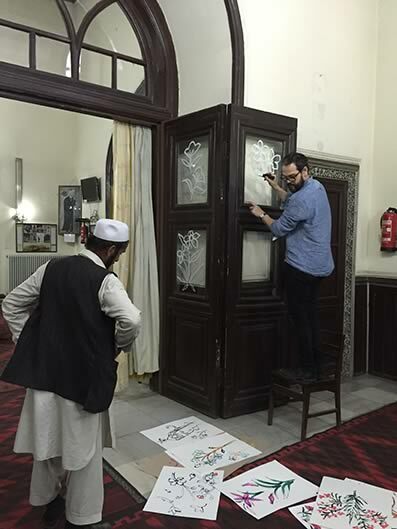 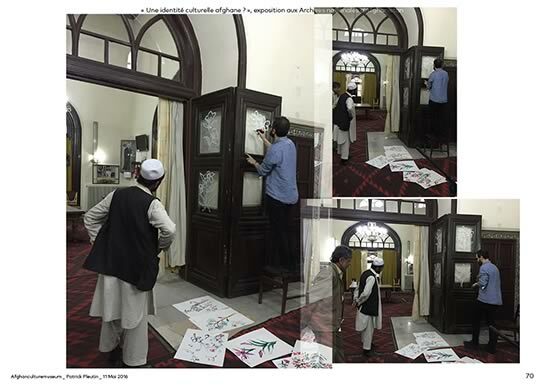 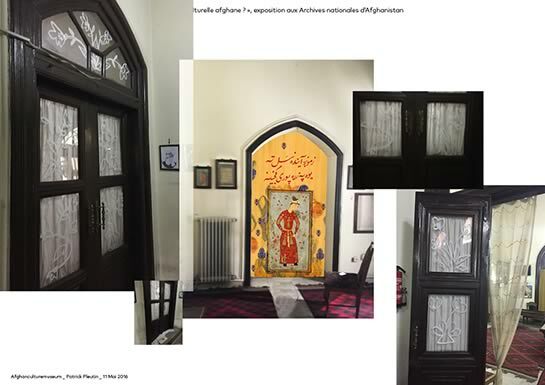 All the glasses of the doors, as a magical gesture, have been decorated with white painted copies of flowers inspired by details of miniatures, turning the entire museum into an immense herbarium. 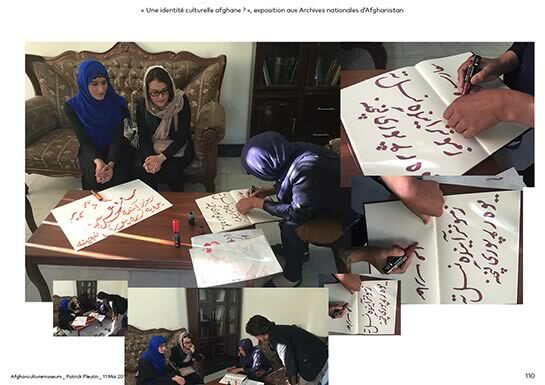 "My culture is genuinely plural. 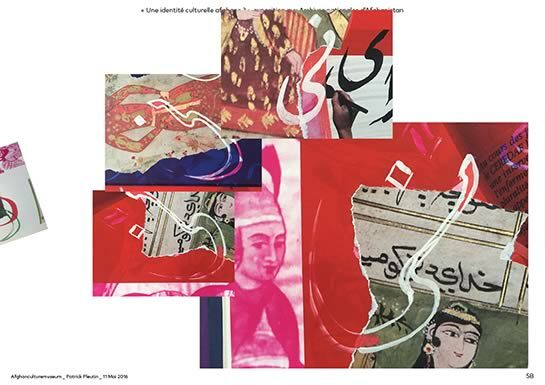 So, my cultural identity is defined by its interaction with the Indian, Persian-speaking, Arabic, Turkish and Chinese civilizations. 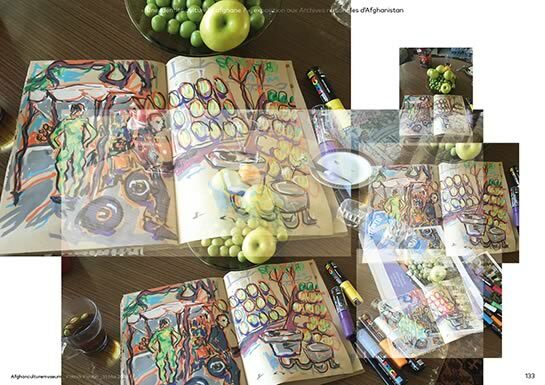 Seventy two nations shall hear from us their secrets. 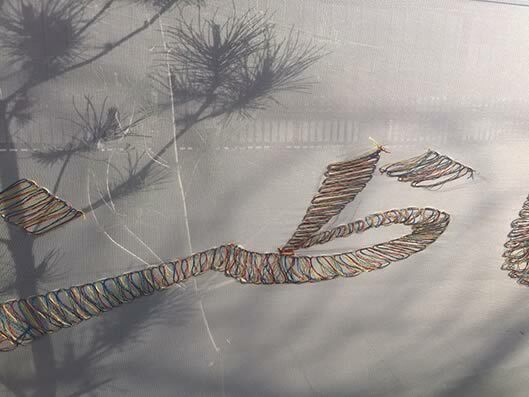 We chant the air of two hundred religions on a single note of flute. 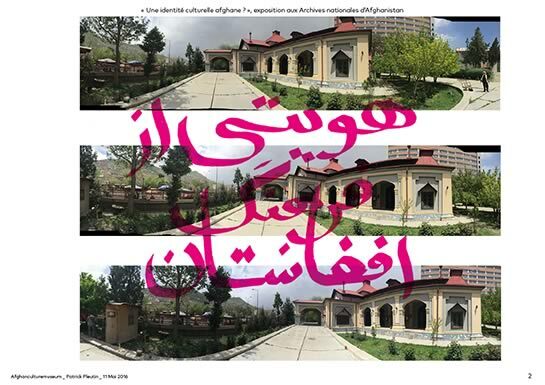 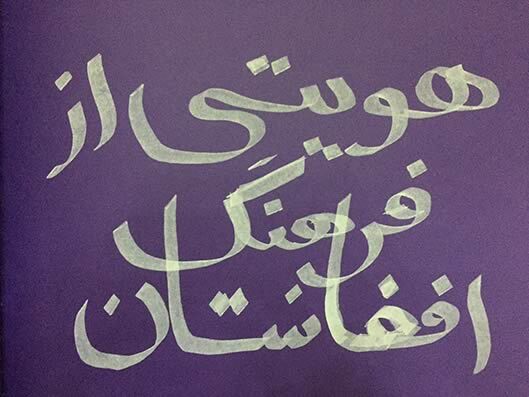 The mixture of ethnic groups and cultures, the richness of this land is threatened by the wars, let us wish ardently the peace to protect this very unique wealth of ours"